She is planning to visit him upon her return from Kyiv. 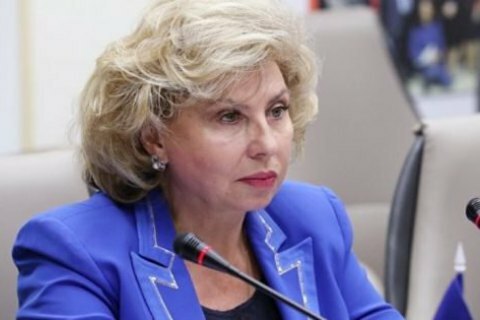 Russian ombudsperson Tatyana Moskalkova has said that Ukrainian film director Oleh Sentsov, who was illegally convicted in Russia, refused to undergo a medical examination by doctors to be selected by his lawyer and family. "He said he did not want to see any doctors, that he was strong, that they should not expect him to and that he would insist on his position until the end," she said upon arrival in Kyiv, according to 112 Ukrayina TV. She said that Sentsov "gets up and talks". "I see no fatal risk, but I could not but be worried because a 40-day-long hunger strike is a very long term," she added. She added she got very detailed updates from the local ombudsperson. According to Moskalkova, she was going to visit him upon her return from Kyiv. "If there is a permit to visit him with Lyudmyla Denisova, I will go with her," she said. The Ukrainian and Russian ombudspersons earlier planned to visit 34 prisoners in each country. This was agreed during a phone conversation between the two presidents on 9 June. Denisova, who has been in Russia since 15 June, has been denied access to any Ukrainian political prisoner.